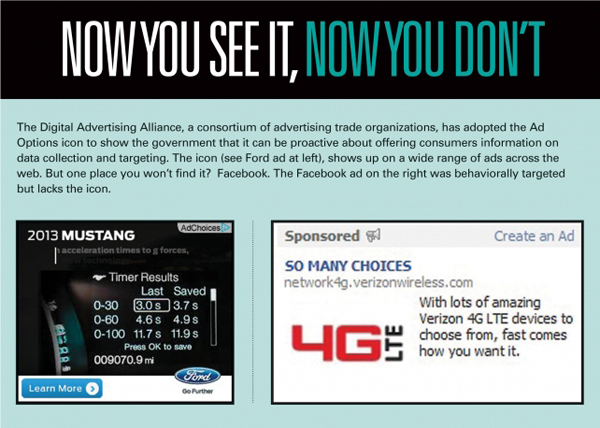 The Digital Advertising Alliance, an affiliation of ad trade groups, created the “Ad Options” icon for inclusion on all online advertisements in an effort to improve transparency about how advertisers are collecting and using users’ data. It’s a noble goal, but there’s only one problem: Facebook doesn’t want to participate, and as one of the biggest sellers of online advertising in the world, that’s a problem. The “Ad Options” icon makes it easier for users to opt out of targeting, while the process is decidedly more difficult on Facebook. By refusing to comply with industry standards, Facebook is undermining the entire legitimacy of online advertising. As one of the biggest online advertising platforms in the world, and a publicly traded company to boot, Facebook owes it to its users to be more open and transparent about its use of their data. They must realize that their hesitancy to play by the rules is why so many users are terrified that their personal data is being compromised in the first place. To learn more about the DAA Program, click here.